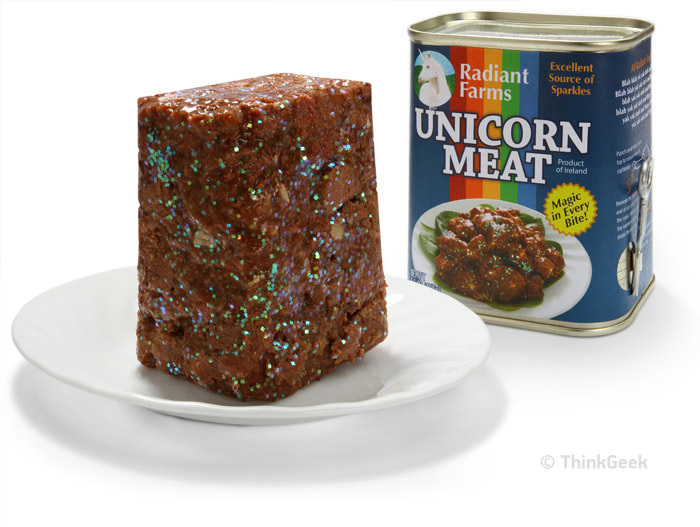 As I was searching for exotic new meats to try, I came across one I had never even thought the meat of a unicorn meat, for real?! Now, you’re asking yourself, what the heck man, you can’t eat a unicorn. Well actually you can now. It’s canned meat, sort of like spam. It comes in nice decorated can so you know what you’re going to eat. Basically its magic in every bite! Brought to you by ThinkGeek, they have gone to I believe Scotland to farm the unicorn and deliver it via a can to us! It’s great, and delicious and excellent daily source of sparkles! basically, it’s already cooked and in a can, ready for you to consume. But I do recommend heating it up. What I like to do is dice a little bit of garlic, toss in a pan with olive oil and toss the meat right in there for about 2-4 minutes. Now, you’ll want to deglaze the pan with some white wine, and a chunk of butter, and there you go, you have a nice sauce to go over the meat. I serve usually with a lite rice pilaf and a vegetable blend. But, there are many ways to skin a unicorn, I mean eat a unicorn. Click here for some fine recipes. Like anything, if consumed for long periods of time there will be some side effect. As to will you poop rainbows, that has yet to be determined. I personally have not visited the Radiant Farm in Kron. So, I can not actually answer the question right now. I have sent emails to the PR department, and I haven’t heard back from them as of yet. Please be advised and do not eat this, try the dragon meat instead. I would have to say, the canned version has a bit more preservatives and likely has a binding agent such as wheat, so no the canned version is not gluten-free. However, if you can get free-range non-canned meat, that is gluten-free. What is the sparkles to calories conversion? haha, we love this question. Sparkles have no calories, duh! What do you recommend as a drink pairing withe meal? A nice dark red wine, probably a Shiraz. Or coke-cola. Can you mix lucky charms and unicorn together? Caution, extremely awesome results! You like rainbows and glitter, than this combo is going to knock your socks off! We hope this review of unicorn meat has made you want to try it. We loved every bite of it and so will your friends. But to be completely honest, you should probably get some now before it’s no longer available. People get all up in arms about this product and we don’t know why? It’s really just a cute stuffed unicorn that may or may not be in bite sized pieces. That is up to you to decide. But if you do, it’s available here for a great price.